Jonathan Bosworth learned an appreciation for fine fibers and fine woodworking from his parents, Ed and Helen Bosworth, who were both well-known around Ithaca NY as weavers. Ed also made looms and other tools for weavers in addition to furniture. With his dad, Jonathan made his first charkha some 40 years ago for a state fair in New York — and won a prize for his handiwork. Inspired by the Indian charkha, but wanting to make a wheel that American spinners would adapt to quickly, he developed the Journey Wheel by changing the hand-turned charkha wheel to a treadle and changing the quill to a flyer assembly. Nearly four decades later, Jonathan’s Journey Wheels are praised for their innovative design, brilliant engineering and magnificent workmanship. As the spinning world turned more to cotton in the past few years, Jonathan returned to the charkha, and now makes both book- and briefcase-size charkhas to the delight of spinners everywhere. Jonathan is pleased that his older son David, now a graduate of Cornell University’s Architecture program, is following in the woodworking traditions that reach back in his family to the 18th century. Younger son Daniel lives in Western Massachusetts. Jonathan lives in Acton, Massachusetts, with his wife Sheila, who is a professional musician by day and a happy spinner by night. They share their home with their cats Sparky and Smokey. Sheila Bosworth learned to spin in self-defense after two clueless fiber festivals. A long-time quilter and seamstress for historical costumes, she “got it” with a drop spindle long before hands and feet worked together on a wheel. Now Sheila and her drop spindles are inseparable — she takes them with her wherever she goes. 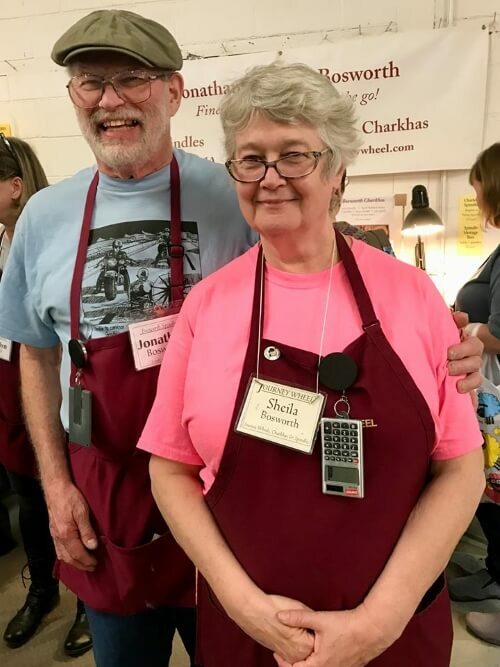 When Sheila is not spinning, she helps Jonathan in the shop by rough cutting and polishing spindle whorls, as well as handling most of the web and phone orders. She has developed a fine eye for beautiful woods, inspired by the beautiful spinning tools which Jonathan makes. In addition to her love of fiber, Sheila is also a professionally-trained musician and specialist in the field of Early Music. She directs a semi-professional recorder consort and leads an active regional early music progam for amateur players and singers. She taught recorder to the young singers of the Boston Boy Choir for a decade. Since 1997, she has led regular performance and study tours to Italy, presenting concerts in Rome, Florence, Venice, Padua, Bolzano, Orvieto, Siena, Milan, Genoa, Perugia and many other beautiful historic places.